I've had this girl for a few years now, and have been through a lot with her. When I first got her, I over watered , and she lost some leaves. Then I sun burnt her, and she lost more leaves. Now that I know what she likes, and she is more happy, I'm debating on chopping her above the bad leaves. She would look like new again, but would have to grow an entirely new root system (which I've done before). I'm posting this, because I'm not entirely sure what to do, and would like some other opinions. Should I chop it below the good leaves, and leave it in the same pot? Or should I not chop her, and just put her in a bigger pot? Here's a pic, and sorry for the back light: Thanks everyone! Re: To chop, or not to chop large aloe? Aloes will grow upwards anyway. They get very tall and have a stem. I would leave it as is. I would definitely not plant it deeper because I expect it will rot. Aloes are dry plants and while they do root very easily I don't think they would do the 'tomato' thing. If you did chop it it could probably root easily though. Remember to callus the cut before planting. Thanks evtubbergh. I'll probably just do an up-pot, as you suggest. I think the larger pot will be more difficult for the cats to knock over as well . This one actually just got knocked to the floor by the cats, but somehow came out of it with barely a scratch. I still can't believe how little damage was done to the plant after falling 3 ft to the floor. Not even a broken leaf. Thanks for your replies, and good info. I appreciate the help. 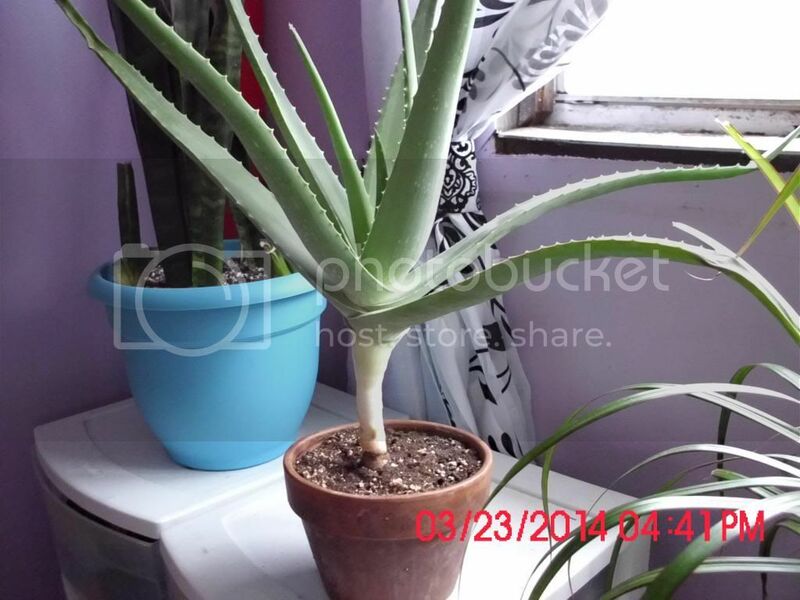 It would be cool if over many years, it looked like an "aloe tree", with a long stem. . I've seen pictures of aloes like that before, but I though it was only a certain type of aloe that grew to look like a tree. Will it grow straight up, or flop over eventually? Not all of them grow upwards, granted, but that looks like Aloe vera or similar which does grow upwards. An aloe tree is Aloe barberae and is defintley not what you have so it won't grow that far upwards. I was given a teensy little tree aloe that has tripled in size in less than 2 years! On the other hand if you have Aloe ferox or a number of others it could grow fairly tall. By the leaves I would guess Aloe vera by the way. Do you know what it is? Oh and by the way you should keep it very dry in the winter. It needs cold (at night), dry and very sunny weather and will flower in winter. In summer it can get more water and food and must also have sun. It is an aloe vera barbadensis, I think. It is the large variety, and the only reason it's not twice this size, is because my area's climate is not the best. 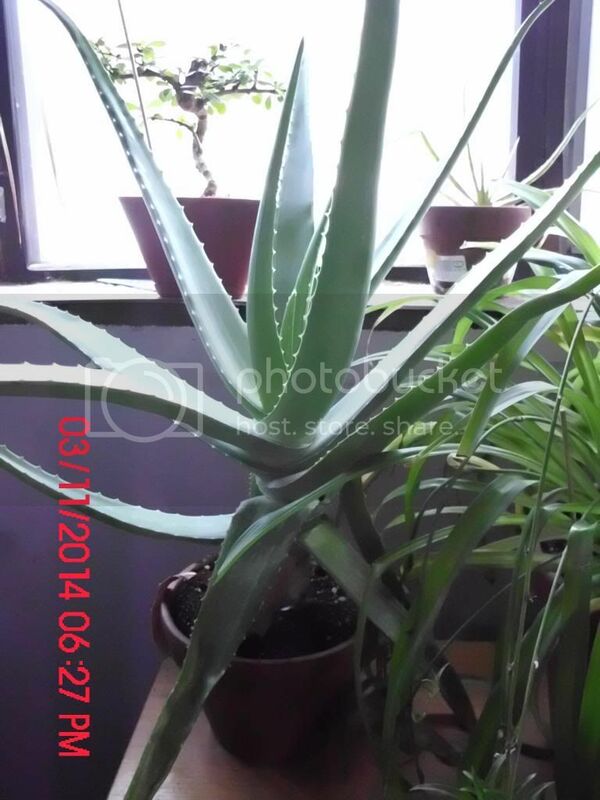 I have another aloe vera that looks IDENTICAL to this one, yet only grows to about half it's size. I know it's an aloe vera as well, so this shows me that there are different strains ( or varieties ) of aloe vera. My plants only get so much sun, due to a lot of trees, that are close to the house. There's not too much I can do about it, so the lighting situation is what it is. Although I've been considering supplemental lighting for future winter seasons, because of this. As far as water in the winter goes, I have been watering when the soil has stayed bone dry for a while (in winter). I only watered it two, maybe three times, the entire winter. Is that too much? Should I treat it like a cactus, and give hardly any water at all, during the winter? Thanks. As far as I can tell Aloe barbadensis and Aloe vera are synonyms but you're right there seem to be many strains. Also you're right that they don't normally have long stems, I mistook some of ours for Aloe vera. I am used to seeing aloes with some stem. I would still leave it and let it get bigger like it is. From what I can tell it should flower in late winter to early spring, when conditions are just right. That may translate into later spring for you because it is from the Mediterranean where winter temperatures would be higher to start. I think your watering practices are probably fine and if it seems happy these days like that then keep things the way they are. My aloes and succulents sometimes get watered more often than I think they should in winter but they do fine. I would try get them as much sun as possible, year round though. Mine are flowering now, but they are outside. Mine tend to lie on the ground from the weight and I have to cut them back every year because they produce so many offsets. Whenever I cut them, they sprouts up again and produces even more offsets from the cut ends. I cut them to reduce the size of the clumps. baileysup, your plant looks good in the first photo but, not in the second one. The leaves are baggy and one of them is beige and shrivelled. When they are that colour, it's best to remove them. The same thing happened to my Aloe Juvenna plants, in the past. When I did nothing, that shrivelling spread and a plant died. On another, I removed the shrivelled leaves and it did not spread. It has to be done carefully, by peeling off a dead leaf and then, using scissors to cut off any part of it that is too small to peel. The leaves went baggy when the plants were watered too much. I don't have other kinds of aloes, just Aloe Juvenna. I treat mine exactly the same as I treat cacti and they do well. I also found that I can take cuttings from them and, when repotting, it helps to keep the plant at the same depth in soil; not any deeper or shallower that it was. I hope that this helps with yours. I think a clay azalea or bulb pot -- shallower and wider -- would work well for your plant to keep from being top heavy and toppling. 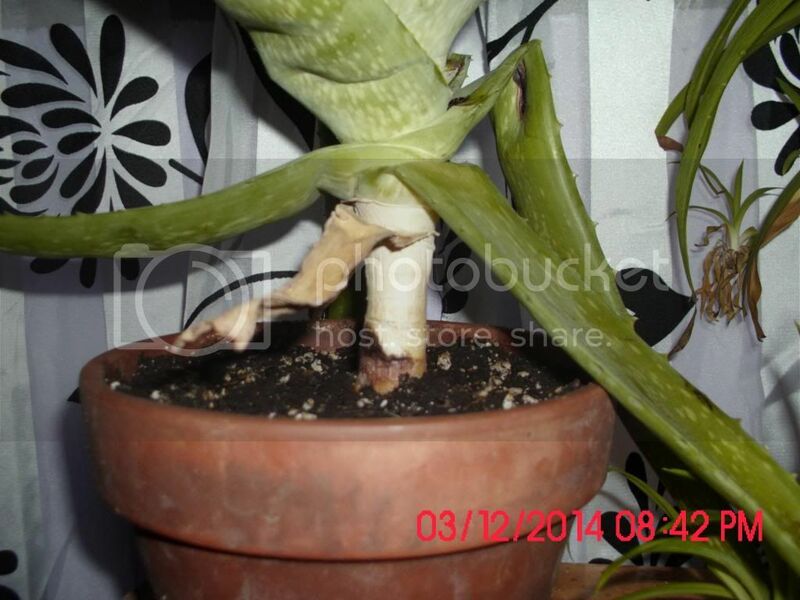 Sweyn wrote: baileysup, your plant looks good in the first photo but, not in the second one. The leaves are baggy and one of them is beige and shrivelled. You might as well remove the dead leaves. They are not needed anymore. Sweyn: Will do . Thank you. Stage 1 complete. Now to wait for warmer weather, and then initiate chop. I might up-pot it after the chop, as there appear to be a few root nubs growing all the way up the stem. I'm guessing a pot that's a little deeper, and a little wider. Don't know yet. I could just leave it, and not chop it, but then I would need a really deep pot. I think it would be fine if I buried the stem as is, and it would grow a SUPER root system . It would just sprout new roots out of the stem, as it's already beginning to do. I think that's what I'm gonna do. Just plant it in a monster pot, and not chop it. HAHA! OPERATION ALOE PROCEED!!!!!!! !